View of NASA’s Skylab Orbital Workshop in Earth orbit as photographed during departure of its last astronaut crew on Slylab 4 mission for the return home in Apollo capsule. Skylab was America’s first space station. The massive orbital workshop was launched unmanned to Earth orbit 40 years ago on May 14, 1973 atop the last of NASA’s Saturn V rockets that successfully lofted American’s astronauts on the historic lunar landings of the Apollo-era. On May 13, NASA commemorated the 40th anniversary of Skylab’s liftoff with a special roundtable discussion broadcast live on NASA TV. The event started at 2:30 PM EDT and originated from NASA Headquarters in Washington, DC. Participants included Skylab and current ISS astronauts and NASA human spaceflight managers. Watch the recorded NASA Skylab 40th Anniversary briefing on YouTube – below. The Skylab project was hugely successful in accomplishing some 300 science experiments despite suffering a near death crisis in its first moments. Shortly after blastoff of the Saturn V from Launch Complex 39A the station was severely crippled when launch vibrations completely ripped off one of the stations two side mounted power generating solar panels. The micrometeoroid shield that protected the orbiting lab from intense solar heating was also torn away and lost. This caused the workshop’s internal temperatures to skyrocket to an uninhabitable temperature of 52 degrees Celsius (126 degrees F). Furthermore, a piece of the shield had wrapped around the other solar panel which prevented its deployment, starving the station of desperately required electrical power. All nine astronauts that worked on Skylab were launched on the smaller Saturn 1B rocket from Pad 39B at the Kennedy Space Center. The launch of the first crew was delayed by 10 days while teams of engineers at NASA devised a rescue plan to save the station. Engineers also ‘rolled’ Skylab to an attitude that minimized the unrelenting solar baking. The first crew aboard Skylab 2 launched on May 25, 1973 and successfully carried out three emergency spacewalks that salvaged the station and proved the value of humans in space. They freed the one remaining stuck solar panel and deployed a large fold out parasol sun shade through a science airlock that cooled the lab to a livable temperature of 23.8 degrees C (75 degrees F). The Skylab 2 crew of Apollo 12 moon walker Charles Conrad, Jr., Paul J. Weitz, and Joseph P. Kerwin spent 28 days and 50 minutes aboard the complex. The outpost became fully operational on June 4, 1973 allowing all three crews to fully carry out hundreds of wide ranging science experiments involving Earth observations and resources studies, solar astronomy and biomedical studies on human adaption to zero gravity. The second crew launched on the Skylab 3 mission on July 28, 1973. They comprised Apollo 12 moon walker Alan L. Bean, Jack R. Lousma and Owen K. Garriott and spent 59 days and 11 hours aboard the orbiting outpost. They conducted three EVAs totaling 13 hours, 43 minutes and deployed a larger and more stable sun shade. The 3rd and last crew launched on Skylab 4 on Nov. 16, 1973. Astronauts Gerald P. Carr, William R. Pogue, Edward G. Gibson spent 84 days in space. Their science observations included Comet Kohoutek. They conducted four EVAs totaling 22 hours, 13 minutes. Skylab was the size of a 3 bedroom house and far more spacious then the tiny Apollo capsules. The complex was 86.3 ft (26.3 m) long and 24.3 ft (7.4 m) in diameter. It weighed 169,950 pounds. “Skylab took the first step of Americans living in space and doing useful science above the atmosphere at wavelengths not possible on the ground and for long duration periods,” said astronaut Owen Garriot, science pilot, Skylab 3. Skylab was also the first time student experiments flew into space – for example the spiders ‘Anita and Arabella’ – and later led to a many educational initiatives and programs and innovative ideas. The Skylab project taught NASA many lessons in designing and operating the ISS, said NASA astronaut Kevin Ford who was the Commander of the recently completed Expedition 34. NASA had hoped to revisit Skylab with Space Shuttle crews in the late 1970’s. But the massive lab’s orbit degraded faster than expected and Skylab prematurely plummeted back to Earth and disintegrated on July 11, 1979. 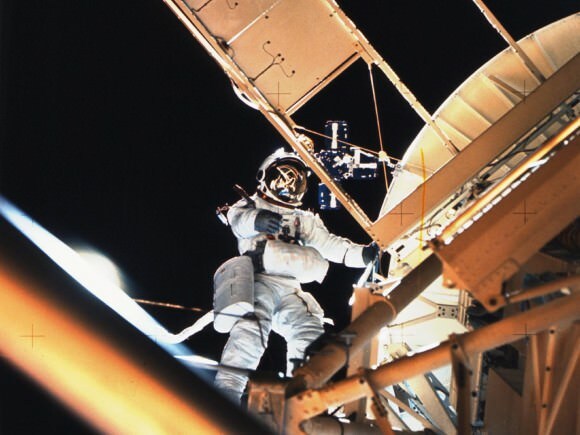 See a photo gallery of views from the Skylab missions herein. Be sure to follow today’s (May 13) undocking of the ISS Expedition 35 crew (Commander ‘extraordinaire’ Chris Hadfield, Tom Marshburn and Roman Romanenko) and return to Earth tonight aboard a Russian Soyuz capsule. The ISS is a fantastic measure of just have far we have come in space since Skylab – with the US and Russia peacefully cooperating to accomplish far more than each can do alone. June 12: “Send your Name to Mars” and “Antares Rocket Launch from Virginia”; Franklin Institute and Rittenhouse Astronomical Society, Philadelphia, PA, 8 PM.